"Are you ready for some Duff love?" shouts Duffman with a big toothy smile. He is always ready for a fantastic time. Who doesn't want to party with him? Normally only the residents of Springfield have the accessibility to good ol' Duff Beer. Now, with Homer's permission, of course, the licensed Simpsons kit is available to you (sorry it doesn't include the beer). Time to start the party! 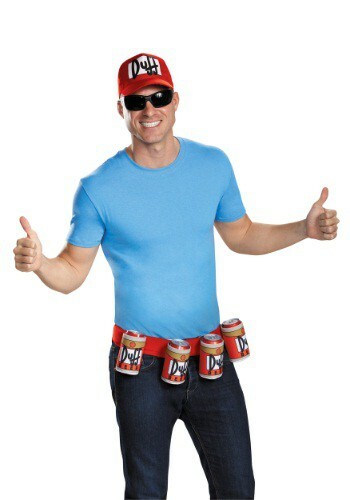 Duff Beer wants you to drink responsibly while looking handsome. You may not be drinking the same stuff as the boys at Moe’s Tavern, but you’ll still be living it up with your friends. Like the slogan says, “Can’t get enough of that wonderful Duff!" The licensed Adult Duffman Kit includes a Duff logo hat that has an elastic band for a snug fit. An awesome foam belt that fastens with the magic of Velcro (yes, Velcro is magic). On the belt 4 can coolers with the Duff logo, this way any beverage will look like a Duff Beer can (those other drinks can fake it till they make it). One word of advice: don't do to much belly dancing, you'll shake up the beer! Just add a smile, cool shades, and flash those muscles like the Duffman himself. When you enter a room, remember the Duffman tagline, "Oh, yeah." You will be set for a great night.